About 150 University students marched across the River Campus to protest racism at the University and to present President and CEO Joel Seligman with a list of demands to improve the racial climate at Rochester. At Wallis Hall, a group of five students representing minority leadership groups met briefly with President and CEO Joel Seligman to present him with a three-page list of demands designed to improve the racial climate on campus. In a statement issued after the meeting, Seligman said he would carefully review the students’ petition and issue a statement early next week. He reiterated that racism has no place at the University, which must be a campus that is welcoming, respectful, and safe for all. The students’ demands included calls to improve the campus learning environment for minority students, initiatives to improve inclusion and representation of minority students among faculty, staff, and student populations, and efforts to increase funding and support for underrepresented minority students and departments. One concern for the students are social media applications such as Yik Yak that allow users to post anonymously. The group asked that the University configure campus servers so that the app’s traffic can no longer be accessible through Rochester’s wireless network. Several students said threatening posts on the app have made them fear for their safety. “We are afraid to leave our houses,” said Kiara Cruz ’16, president of the Spanish and Latino Students’ Association. Other demands included making racial awareness and training programs mandatory for faculty and staff, better funding and promotion for the “bias-related incidents” program and other initiatives, more transparency in the process for recruiting and hiring faculty, revising the Code of Student Conduct to give more prominence to discrimination, establishing a fund to support cultural groups served by the Minority Student Advisory Board, better support and more resources for programs like the Office of Minority Student Affairs, the Kearns Center, the Frederick Douglass Institute, and the Douglass Leadership House, and other initiatives to address their concerns. With chants such as “Whose campus? Our campus!” and “We can’t be ever better if we’re not together!” the students moved across campus, beginning outside the Frederick Douglass Leadership House and ending one hour later at Wilson Commons. From Wallis Hall, the students moved to Rush Rhees Library and to the Eastman Quadrangle, where the statue of George Eastman was papered with the students’ demands, and ended at Hirst Lounge. 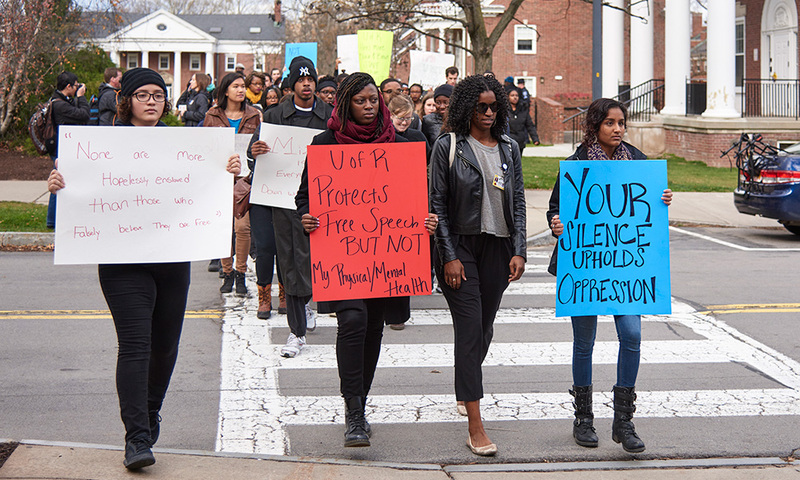 Daniel Southwell ’18, a public health and anthropology major, said the march was long overdue.